Today is Sunday. It is arguably one of the most beautiful days we have had so far this year in Boulder, and Boulder is arguably one of the most beautiful places to spend the day outdoors. I wish I could tell you that I am about to climb one of those Flatirons, but alas, that is not the case. 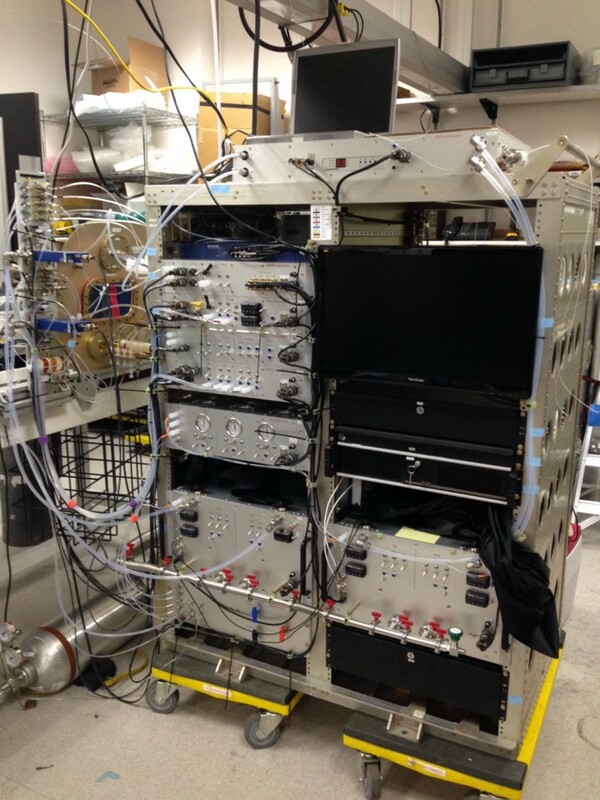 This beauty was built by me, Tom Ryerson and Jeff Peischl in my lab at NOAA and will be measuring nitrogen oxides and ozone on the upcoming ATom deployment. Nitrogen oxides (which can be broadly defined as compounds containing an N and O) and ozone (O3) are intimately linked in the atmosphere and both can be the result of anthropogenic, or human-caused, pollution. The primary source of nitrogen oxides (NO and NO2, collectively termed “NOx”) in any populated area is combustion and so is emitted from things like vehicles and power plants. Emitted NO is oxidized rapidly in the atmosphere to form NO2, and NO2 will in turn photolyze in the presence of sunlight and oxygen to produce O3. My instrument detects these compounds optically by measuring the light that is emitted when NO reacts with O3. So to measure ambient O3, we react it with NO inside the detector to form excited state NO2 (or NO2*), which then releases a photon as it returns to its ground energy state; to measure ambient NO, we do the reverse and add O3. NO2 is measured by first converting to NO via photolysis with blue LEDs, and then again adding O3 to make NO2*. The fourth channel measures the sum of all forms of nitrogen oxides, including HNO3, alkyl nitrates, and peroxyacyl nitrates (collectively term “NOy”), by first thermally decomposing them to NO over a pure gold catalyst heated to ~400°C, followed again by reaction with O3 to form NO2*. Today, I am working to optimize the sensitivity of my four detectors by systematically adjusting the high voltage power and the noise cut-off filtering to each detector. It’s slow and tedious and is affording me too much time to play WordBrain on my iPhone while I watch data tick by on my computer screen. But we are down to less than 2 weeks before we have to ship it off to Palmdale so it’s crunch time. This is my life now. This summer, NASA’s DC-8 flying laboratory will soar up and down through the atmosphere around the world to study air pollution, greenhouse gases, and more. Chelsea Thompson (CIRES scientist at NOAA), AKA Iron Lady, will be aboard. Follow her and her colleagues here.